Happy Birthday 2 U malayalam movie directed by M A Nishad will have Suresh Gopi in lead. It would be Suresh Gopi's 2nd outing after getting featured in Joshiy's 'Salaam Kashmir' while M A Nishad known for directing Vairam, Good Luck and No 66 Madhurai Bus is back with his new venture titled 'Happy Birthday 2 U'. The actor had earlier done the lead role in M A Nishad's Vairam. 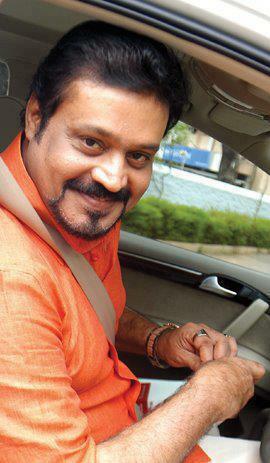 Happy Birthday 2 U malayalam movie directed by M A Nishad will have Suresh Gopi in lead. It would be Suresh Gopi's 2nd outing after getting featured in Joshiy's 'Salaam Kashmir' while M A Nishad known for directing Vairam,Good Luck and No 66 Madhurai Bus is back with his new venture titled 'Happy Birthday 2 U'. The actor had earlier done the lead role in M A Nishad's Vairam. Suresh Gopi who had been away from the malayalam film industry for an year and a half is back with 'Salaam Kashmir' will also be seen in Shankar's magnum opus 'I'. Vairam: Fight for Justice, his previous project with M A Nishad did receive positive reports from theatres. The movie which told a crime investigation brought an advocate, police officer, and the journalist start the fight for justice together to fight for justice. M A Nishad who had shown his presence in the industry with a couple of movies is looking forward with his new venture which is expected to roll soon. Even though 'Vairam' got noticed, his later projects Good Luck and No 66 Madhurai Bus was not much good enough to keep the audience intact. 'Good Luck' which featured a young cast including Asif Ali, Rima Kallingal couldn't keep the promise for its loose comedy. Learned from the gaffe, we can expect that Happy Birthday 2 U will be an entertainer with all flavours needed for a commercial movie. With a number of malayalam movies announced in 2013, it is being a tough time for the film makers to reach their creativity onto the silver screen. As per available information if all the announced movies reach theatres, the number would touch 200 only in the current year. So what is Nishad's new offering? Let's wait and see.